This set comes with a really cute set of 3 pacifier clips. You get three pink/white/red chevron patterns. They are reversible as well and have grey and white patterns on the bottom. The colors and patterns are really vibrant and fun. There is a string on the end that you can use to attach to pacifiers or other toys or items. Really well made and keeps baby from dropping that pacifier. These make adorable shower gifts as well. I got my set to give as a gift and I can’t wait for the person I got them for to open them and see their reaction. Super super cute and high quality. 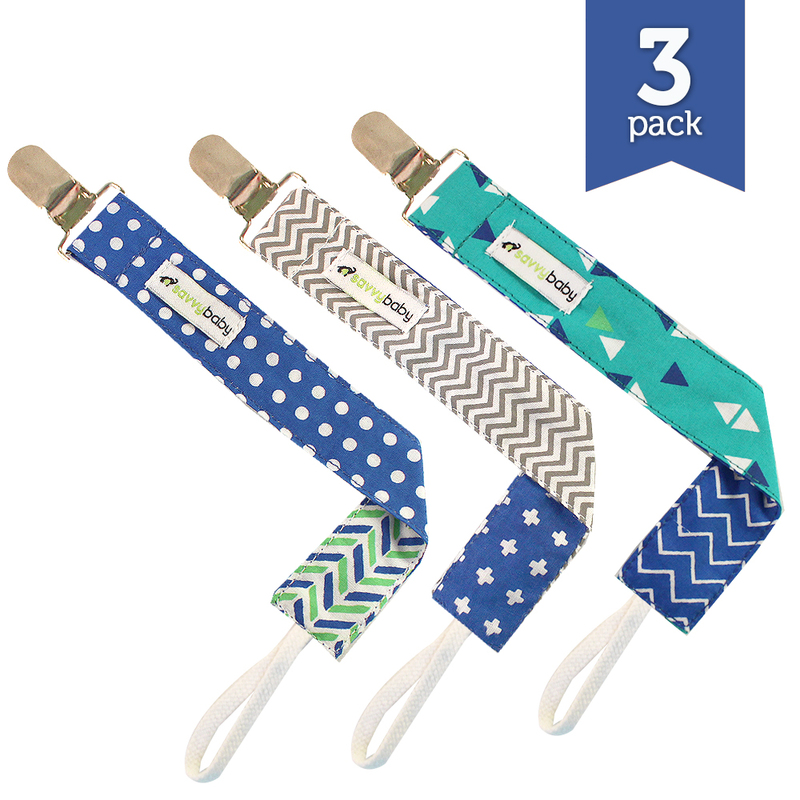 FASHION MEETS FUNCTION with our 3 pack of pacifier leashes. Our unique designs in bright and fun colors will keep your baby’s accessories off the floor in a stylish way. Our unisex designs are perfect for boys, girls, babies, and toddlers. Not to mention it is the Best Baby Shower Gift! WASHABLE, DURABLE & NON-TOXIC – Our bib clips are made from high quality cotton and nickel-free metal clips. No BPA, No Pthalate, No Lead, No Latex. STRONG, DURABLE CLASP & CORD – Our pacifier holders are made with high quality clips that won’t pull off but are gentle on clothes. Our durable loop will attach to any style pacifier or teether and last for years to come. UNIVERSAL FIT & FUNCTION – You won’t believe all of the uses for these stylish pacigrips! Best pacifier clip and holder for teething toys, soothies, baby blankets, stuffed animals, and drool bibs. 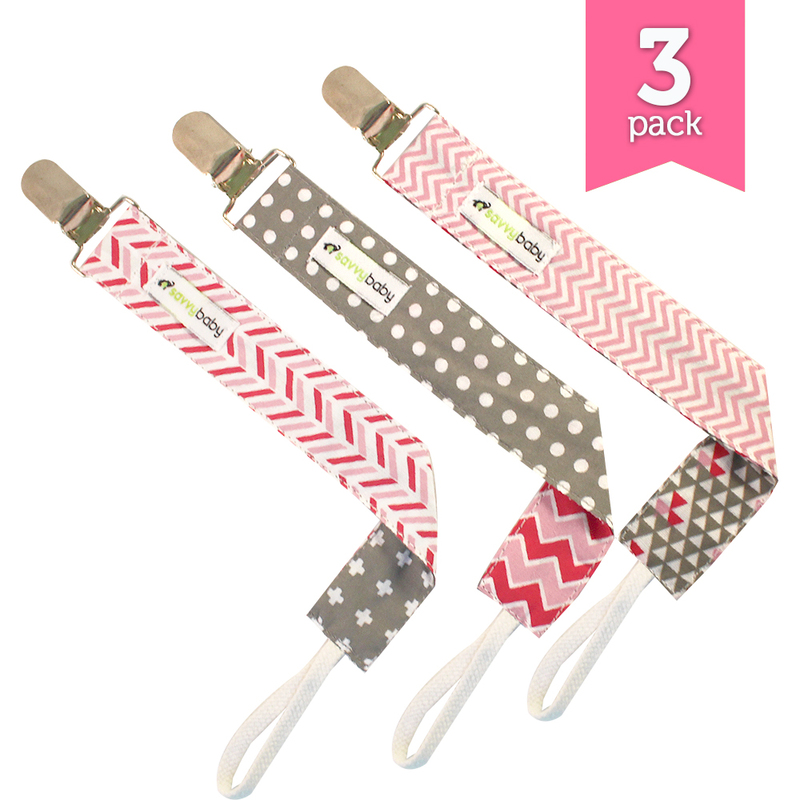 You can also use these leashes as a baby blanket clip for keeping your baby covered up while riding in his/her stroller. They look great with our SavvyBaby Bandana Bibs too! SATISFACTION GUARANTEED – At SavvyBaby we are crazy about our customer satisfaction! If there is anything we can do to make your experience better or if you need to return an item, we can help you no questions asked. Add our Pacifier Holder Clips to your cart today and order with confidence! This set comes with a really cute set of 3 pacifier clips. You get a blue & white polka dot one, blue & white diamonds, and a green with traingles. They are reversible as well and have chevron patterns on the bottom. The colors and patterns are really vibrant and fun. There is a string on the end that you can use to attach to pacifiers or other toys or items. Really well made and keeps baby from dropping that pacifier. These make adorable shower gifts as well. I got my set to give as a gift and I can’t wait for the person I got them for to open them and see their reaction. Super super cute and high quality. 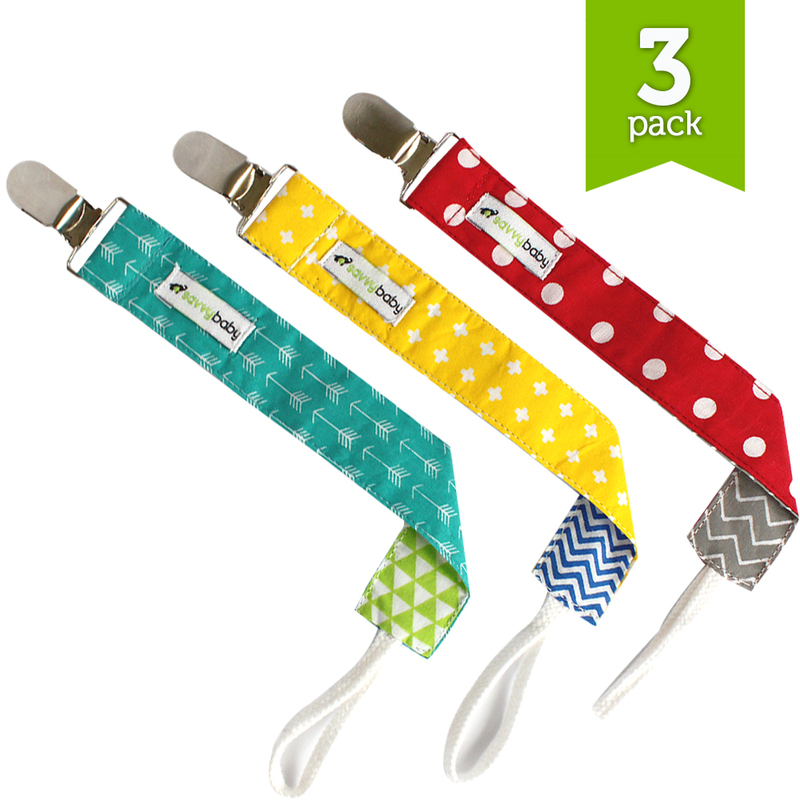 FASHION MEETS FUNCTION with our 3 pack of pacifier leashes. Our unique designs in bright and fun colors will keep your baby’s accessories off the floor in a stylish way. Our unisex designs are perfect for boys, girls, babies, and toddlers. Not to mention it is the perfect baby shower gift! This set comes with a really cute set of 3 pacifier clips. You get a red & white polka dot one, yellow & white polka dot & green with white arrows. They are reversible as well and have chevron patterns on the bottom. The colors and patterns are really vibrant and fun. There is a string on the end that you can use to attach to pacifiers or other toys or items. Really well made and keeps baby from dropping that pacifier. These make adorable shower gifts as well. I got my set to give as a gift and I can’t wait for the person I got them for to open them and see their reaction. Super super cute and high quality. UNIVERSAL FIT & FUNCTION – You won’t believe all of the uses for these stylish pacigrips! Best pacifier clip and holder for teething toys, soothies, baby blankets, stuffed animals, and drool bibs. You can also use these pacifier leashes as a baby blanket clip for keeping your baby covered up while riding in his/her stroller. They look great with our SavvyBaby Bandana Bibs too! You’ll find you need your Pacifier Case alot less. You can purchase this set on Amazon!